On April 20, 2010 an explosion occurred at the Deepwater Horizon oil well in the Gulf of Mexico, 50 miles southeast of the coast of Louisiana. Two days later the rig sank and emergency workers reported that oil was being spilled into the Gulf waters. This page is devoted to helping you understand the communities that are threatened by the oil spill. 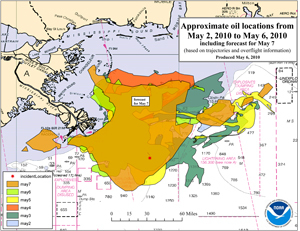 A recent NOAA map showing the extent of the oil spill. Above is a clickable, interactive Google map of the Gulf Coast parishes and counties that may be impacted by the oil spill. The markers give the names of the parishes and counties. You can zoom in and out of the map and recenter as you need. Below is a table that gives geographic and demographic data of the coastal parishes and counties. The source of the data is The American Factfinder service of the US Census Bureau.